What else is there to say but echo the sentiment everyone else is expressing for Between Shades of Gray? If you’ve been listening in on all the hype that surrounded this book prior to release, you’d know it focuses on the plight of innocent Lithuanians, Latvians and Estonians affected by the Stalin regime during World War II. And if you had been just as denied any knowledge of their struggles, you would have thought, huh? I think it’s a shame that not a sliver of their past is studied in schools (for that is where we go for a thing called History Class), but curriculum is so skewed and selected that young people miss out on very important issues. I remember reading in high school, when on the subject of Stalin, that he took over the countries in the Baltic region…a mention, no more than a footnote. We hardly learn about our own contributions during the War here in Canada, what were the chances my teachers were going to tell us about these people? So, you’ve heard the hype, you’ve watched the video on Sepetys’ site and you expect an intense, painful rendering of the life of these forgotten souls. I think Sepetys delivers. Hers was a major undertaking; a great honor but so much promise to live up to. This isn’t just a fictional story about a young girl who is hauled into a train cart marked thieves and prostitutes one innocent night; who, with her mother and brother is sent to labour camps to work in the mud, the biting cold, the sleeting rain with only a piece of bread and rainwater to relieve her hunger; whose future is stolen away, with no justification except for that a man believes she is a sveenya, a pig. Sepetys has to depict the horror these people experienced, accent the dignity and courage they maintained, all without cowering under emotion and the inevitable urge to spurt too much personal convictions. Because even though you are the writer, you must still keep some distance, no? Let the story tell itself, and in this case, let history be exactly that. She is a translator of forgotten memories; she is merely bringing back what history has misplaced. This is, if you haven’t guessed yet, a moving story. The suffering here isn’t anything new. We’ve read it in other books, seen them in movies, learned them from documentaries. As crass as this might sound, they’re all the same: people working to the bone, people being shot for being born wrong, people starving, people living in dilapidated conditions, women being raped, children dying off, men being hanged. Inhuman is the word. But what sets this apart is the turning of an extra page we didn’t see before in the book of monstrosity that was WWII. This was a new set of suffering; of broken toys we never knew were stashed away in the attic. The characters are full and clear and well-loved by me. They have pride, they have guts and what really touches me was how at their weakest, at their moment of almost breaking down, Lina and her friends decide to hold onto that thin thread of spirit; and of endurance. Instead of surrendering, Lina hardens her heart. When in the end, Lina expresses guilt over wanting to live, in the face of so much loss, I just lost it. Hearing her say that she never questioned it once; that surviving was her purpose and home her destination, this amidst death, is a true impression of will. So, why a slightly less than perfect rating? Well, it’s because despite how much this book had me clutching it to my chest, just as Lina clutches at her drawings, there are several editorial decisions I would’ve changed…so much so that I couldn’t get past it, no matter how much I wanted to. Some minor, and some that I think would’ve changed the weight of the story…perhaps emphasized even strongly the importance of keeping up hope, the role of art within Lina’s journey, and made it even more searing with pain. So its more technical, rather than emotional (although the technical would’ve ultimately affected the emotional). The story I was given satisfied me in the deepest, most craving part of my self. I suppose the real issue with the book is that it’s too short. I saw that I was running out of pages and kept thinking that I was nowhere near ready to let go. But who am I in all of this? Just a lone spectator bowing in apology to any soul who’s ever been overlooked. Wonderful review! I have this book now and I can’t wait to read it. Even your review gave me goosebumps, so I should prepare myself for an emotional reading session. Awesome review! I tried reviewing this book but I just couldn’t and I think you got it down perfectly. I’m currently having a my Canadian World History Class and I was shocked too at how we barely mention this. I learned more about what happened from this book than the 5 minutes we spent in class on it. Oof this sounds intense! I’ve seen it around but I’m going to have to really be in the mood to get into this one. Lovely review, Wendy! I loved this book so, so much. Amazing review. And I’m glad you loved this one just as much as I did. This is a very insightful review! Usually, I don’t really read books suring during World War II but I need to read this one, without a doubt. Cillian & Flannery: See! Even in Stalin’s biographies and courses that deal with this topic particularly, these people were still overlooked. Its just the concept of forgetting about the “little guys”, especially since their lives had been just as overturned as every other victim of war, that breaks my heart. Steph: Its like a long, hard life and this book only focuses on the first third. It had potential to be so powerful as to crumble your soul — and it does, but it could’ve been so much more, you know? But its YA, so I suppose that’s why Sepetys had to “lighten” it up. But what I did read was incredible. And thanks everyone for the welcome! I’m happy to be part of the team. I hope this books doesn’t let you guys, who have yet to read it, down. Happy reading! I’ve always had a lot of interest in history, and I agree with you: there are quite a few moments of history that we don’t even touch upon when we study history in school. I guess it’s not possible to learn everything, but still. I wish we’d have a little more of an expansive overview. Oh, I am head over heels in love with your review. Especially this part ‘She is a translator of forgotten memories; she is merely bringing back what history has misplaced.’ I think Sepetys really excels at that. I was a mess after reading Between Shades of Gray and definitely did not want to let Lina go. Amazing review, K! This book sounds heartbreaking and touching at the same time, and I definitely want to pick it up even more now! I’m so happy you are contributing to Wendy’s blog now:) This was a fantastic review. 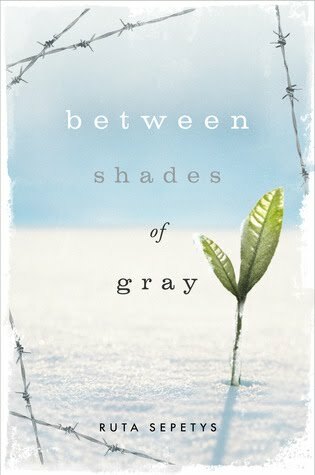 I’ve read several reviews of Between Shades of Gray and each one makes it sound like an absolutely moving experience. You are so right that our educational curriculum is lacking in that we truly only learn about all the wars from…well, basically one perspective. (I am now totally interested in what Canadian schools teach!) Anyway, even after taking several politics and history courses in college about the fall of the Soviet Union and writing some papers about Latvia (seriously:)), I am STILL lacking in information about the Baltics during WWII. Eventually I’ll get to this one and I know that I’ll love it as much as you did. Thanks for the reminder that I need to prioritize it. I’m about 1/3 of the way into reading this. I might finish it today. You’re right about it being very short, when you would expect something longer and heavier. Also, I think the cover (the illustrated one) doesn’t really match the story inside, which isn’t at all light and airy, ya know? I’m curious about what changes you would have made. I think from what you said, you would have made it darker? I remember from the video that the author said she had to lighten it up a lot. I almost wonder if that didn’t take a little away from the story. I have a difficult time reading fiction set during wartime, but this review really makes me want to read this one very soon. Amazing review, K.
The subject of this book is soul-shattering, and I love how you describe the atmosphere, it’s clear you were emotionally invested in this book. Stalin was my obsession for many years, I read two versions the Russian Revolution and some biographies of Stalin, howerver, it will be interesting to read a story that focuses on Lithuanians, since- unfortunately, they didn’t get much attention in Stalin’s biographies and history books I read. great review! i definitely want to read this book right away. K, this is a wonderful review. Your last line was superb. I admit I have been hesitant to pick this one up, just because I know how difficult the topic will be. I am sure it is another look at the blackest depths man’s soul can sink to , while on the other side show the lightness of courage. I guess you just have to be in the right mood. I will be certain to read this and follow it with something light and easy.